Preheat oven to 350 degrees F. Grease one 8x8 inch pan. Cream together 3/4 cup sugar, butter, and egg. In a separate bowl mix together 1 1/2 cups flour, baking powder, and salt. Stir into sugar mixture, alternating with milk. Stir in blueberries. Pour into greased 8x8 inch pan. To make topping: Combine 1/4 cup white sugar, 1/4 cup brown sugar, 1/3 cup flour, cinnamon, and butter. Sprinkle over cake batter. Bake at 350 degree F for 30-40 minutes. *I received a comment saying that the picture didn't match the recipe. Well it is the exact same recipe, I just forgot to mention that instead of stirring the blueberries into the batter, I poured half of the batter into the pan then poured in a layer of blueberries and topped that off with the rest of the batter and then the topping. Also, part of me, the part with the giant sweet tooth, thought it would taste even yummier if I DOUBLED the topping and layered it in this order: batter, blueberries, streusel, batter, streusel. But when it comes down to it, in baking...it's all your preference. This entry was posted on 8:10 AM and is filed under blueberry , blueberry cake , breakfast , cake , coffee , coffee cake , crumb cake . You can follow any responses to this entry through the RSS 2.0 feed. You can leave a response, or trackback from your own site. Gorgeous pic, they look delicious! Looks great! I love blueberry recipes! Spotted these on Tastespotting. Ummm..YUM!!!! Looks yummy, but the picture is not the same as the recipe, I'm sure I can fix it, but I just wish the pic matched the recipe. Anon-I'm not sure why you're under the impression that the picture doesn't match the recipe. Maybe it's the one difference I forgot to mention (which I've already amended in the post) that I chose to layer the blueberries in between the batter, instead of stirring them in, to ensure that each and every bite had sweet, plump, juicy blueberries inside. this looks really nice! must try it! everytime i go to starbucks i always buy the blueberry crumb cupcake,very similar to this one! and my heart start to melt everytime i take a bite. ohhhh,can i have a free taste for this? plssss?! Delicious and yum! 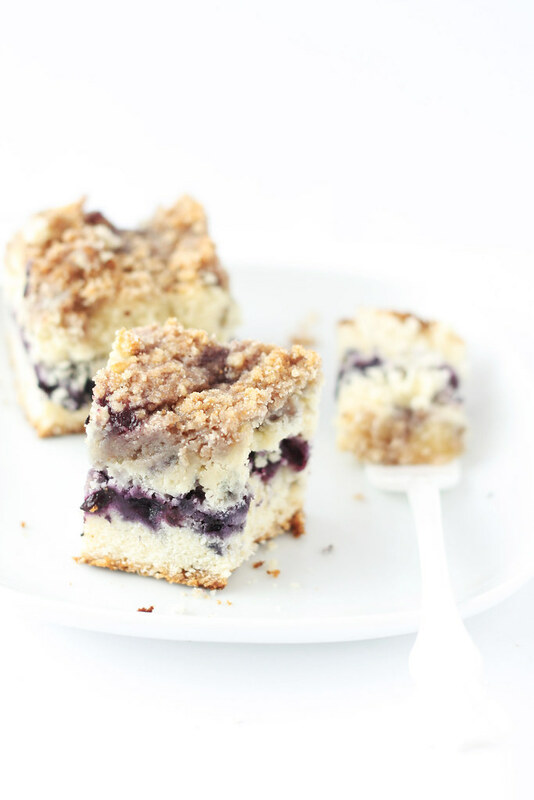 I made this blueberry crumb cake as a suprise treat for my hubbie and he loves it! definately a keeper. Thanks for sharing your recipe. I realize this is an old post, but someone might come across it...my question is when do I add the heavy cream? I'm new to baking and it's listed in the ingredients, but not the steps. Thanks.